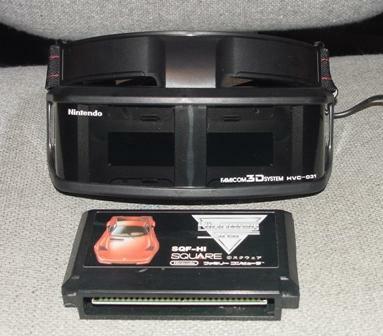 The Famicom 3D System is a fascinating accessory. 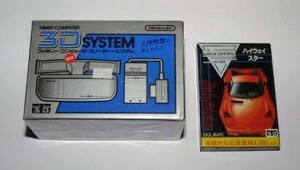 It was designed to give the Famicom gamer a three-dimensional experience during gameplay for specially programmed cartridges, such as Highway Star (known otherwise as Rad Racer). Unfortunately, it was not a popular product in Japan and was never released for the Nintendo Entertainment System in the United States. Nintendo settled on cheap paper 3D glasses for American gamers, probably due to the motion sickness people got when using the goggles. Technically, the 3D Goggles utilize the “shutter glass” 3D method. Compare this to the most popular 3D method: the anaglyph method; this method utilizes the paper red and blue lenses that movie patrons use to watch 3D movies in theaters. The shutter glass method utilizes LCDs in the left and right lenses of the goggles. In simple terms, here is how it works: a specially programmed videogame image on the TV screen alternates rapidly. 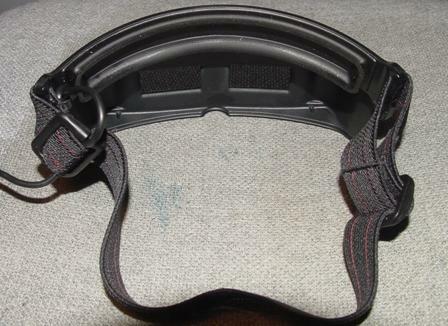 While the gamer is looking through the goggles, the LCD displays are synchronized to block the unwanted image and display the desired image. Each eye will see its proper perspective or field of the display. In other words, the left eye sees the left eye view and the right eye only see the right eye view. The game images, or fields, are refreshed at such a rate that there is no “flicker,” thus creating a truly 3D experience. It’s interesting to see a Famicom game in 3D mode with the naked eye. Don’t do it too long, as you can get a headache from the alternating images. You can enable 3D mode by pressing the Select button during gameplay. Once the game is in 3D mode, the screen almost displays a double image that is slightly angled and blinking. 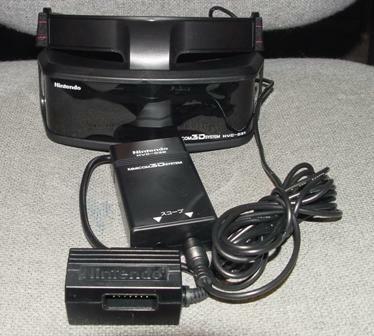 The screen appears this way since the image, or field, is unsynchronized; however, once the 3D goggles are used to view the game image, the image becomes synchronized and 3D. There are a number of 3D games. The most popular are Highway Star, Famicom Grand Prix: 3D Hot Rally, and Falsion. For the Famicom collector, this is a must have. Expect to pay $30 to $55 for this item. The Famicom 3D Goggles and Highway Star. The goggles must be plugged into the Famicom to work. The goggles are padded for a snug fit; the elastic band can be adjusted. The boxes for the 3D Goggles and Highway Star.